Dan first tried pasta in vodka sauce many years ago at one of his favorite Italian restaurants in Chicago. It has taken him a fairly long time to re-create this rich, creamy, slightly spicy tomato sauce, such that you can make it on a weeknight at home. Our version uses pancetta and half & half, as well as a half cup of vodka. The alcohol in the vodka cooks off in an exciting (to Dan), fiery fashion. Sort of like dinner and a show. The ingredients for the pasta in vodka sauce: store-bought tortellini (we like whole wheat), a can of tomato sauce, vodka, half & half, crushed red peppers for some heat, parmesan, and pancetta. Start by dicing the pancetta into small pieces. Pancetta is essentially an Italian or Spanish style of bacon. You can substitute regular bacon if you can’t find pancetta, but it should be available at most grocery stores and it’s worth it. Pancetta has a less heavy, smoky taste than bacon, so it won’t overwhelm the other flavors. In a large skillet, heat a teaspoon of olive oil and saute the pancetta over medium heat. Saute the pancetta until the fat begins to render and it turns brown and crispy. We here at FoodieLawyer care about your cholesterol, so we recommend spooning off the excess fat from the pancettta. Since we’ll be adding half & half in a bit, the sauce does not need this extra fat. Dan is about to Make Fire in the kitchen, so we’ll share some safety considerations. Before adding the vodka to the hot skillet and lighting it on fire, be sure to have a lid that fits your skillet handy (right next to the stove). 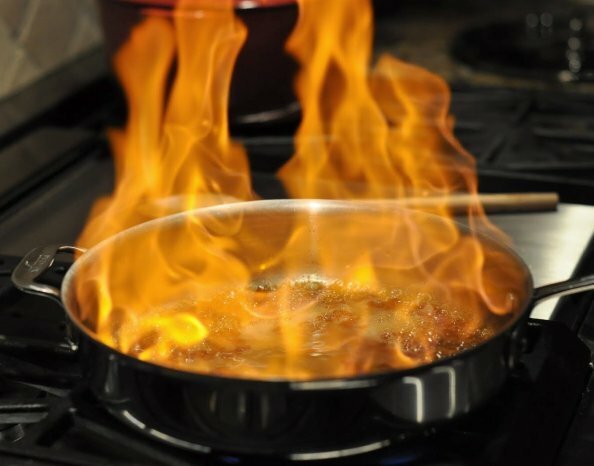 The easiest way to stop an out-of-control fire in a pan is to cover the pan with a lid, which deprives the fire of oxygen. NEVER throw water on any kitchen fire, as this will only aggravate the situation. We also keep a small fire extinguisher in the cabinet under the sink, right across from the stove. Once you have removed most of the grease from the pan, add the vodka. Swirl the vodka around to heat it in the pan, then ignite the vodka with a long lighter. In the interest of keeping your eyebrows, keep back from the flames. I am never comfortable with how high the flames shoot up. But this dish is so good that it’s worth it. You can omit the flame portion of this recipe if you want — just cook it a little longer at this stage so that the alcohol cooks off. After about 30 seconds or so, the fire burns away the alcohol in the vodka sauce (and I am much relieved). Cook for another minute or so for the vodka to further reduce. Next, add a generous pinch of crushed red peppers to give the sauce a spicy kick (optional). Finally, add some dairy to make this a tomato-cream sauce. We use a half cup of half & half. Many recipes call for heavy cream, which we have tried, but we think that the sauce is rich enough with half & half (and a little more healthy without the heavy cream). Stir the sauce well and continue to simmer approximately 15 minutes. While you are preparing the vodka sauce, heat a pot of well salted water to a rolling boil and cook the tortellini. Approximately a minute before the tortellini is done (according to the directions on the package) remove the tortellini from the boiling water using a slotted spoon or a skimmer. Be sure to gently shake off the excess water because you’re going to add the pasta directly to the sauce. Working in batches, add the tortellini to the vodka sauce. Stir the tortellini in the vodka sauce very gently, as the pasta is delicate and will break apart if you are not careful. Simmer the tortellini in the sauce for a few minutes, then sprinkle a handful of grated parmesan cheese over the top of the pasta. Give the pasta and sauce one more gentle stir to mix in the parmesan cheese. We served our Tortellini in Vodka Sauce in low bowls, garnished with a few basil leaves (still have some left in the garden) and a little more parmesean cheese. Heat water in a pot large enough to cook the tortellini. Heat a large skillet over medium heat, add 1 teaspoon olive oil. Add the chopped up pancetta and cook until the pancetta is browned, about 6 minutes. Tilt the pan to the side and spoon out as much pancetta grease as you can. Add the vodka and ignite. Be careful! When the vodka burns off and has been reduced by half, add the red pepper flakes (optional) and cook for about 30 seconds. Next, stir in the tomato sauce and cream, then cook for 10-12 minutes. While the sauce cooks, prepare the pasta according to the directions on the pasta package. Using a large slotted spoon or skimmer, move the cooked tortellini from the boiling water to the skillet of vodka sauce a few at a time, shaking gently to remove as much water as possible. Gently stir the pasta in the sauce, add the parmesan, and gently stir again. Reduce heat to low and cook for a few more minutes.